Very few people in India are actively aware about internet security and while spam filters in gmail, outlook etc. are very crucial, even they cannot stop all the spam. 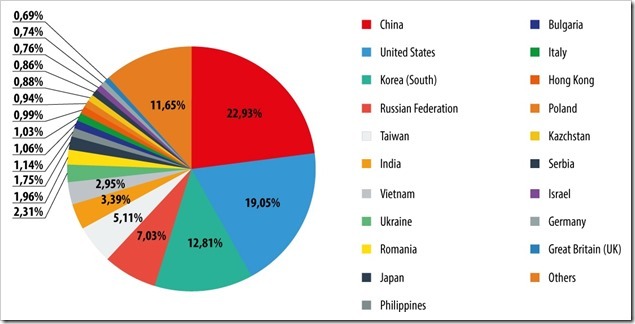 South Korea was number one is sending the spams to European countries (48.6%), while China (23%) was top overall. A spyware that steals the documents (*.docx, *.pdf, *.xlsx) and send to specific email address. Another is IRC-bot/worm called ShitStorm which can carry out DDoS attacks on websites and spread copies of itself via MSN and P2P services. Responding to such mail can make the user part of the botnet. With data becoming more prominent and more online, the amount of spam is bound to increase every day. It has become imperative that individuals take care of their online activity lest they want their credit card information or login information in malicious hands. In the end, I would leave you with the famous ‘Nigerian’ scammers who could not leave the situation of Ukraine alone. Citing some familiar stories about unfortunate tourists in Kiev who had all their money stolen, they requested for financial assistance. $2.5B IBM-Airtel Contract In Jeopardy As Scandal Comes To Light!